Celebrating 10 Years of Esc.rec. with a special discount! | Esc.rec. Celebrating 10 Years of Esc.rec. with a special discount! Yes! Today it has been 10 years since the start of Esc.rec. way back in 2004, when Bart Folmer and me (Harco Rutgers) decided this was a good idea! I did some more counting and concluded that with Esc.rec. I have released 45 releases (both physical and digital), (co-)organized 68 events (ACSH, The Diamond Exchange, festivals, etc.) and worked with 172 artists so far. 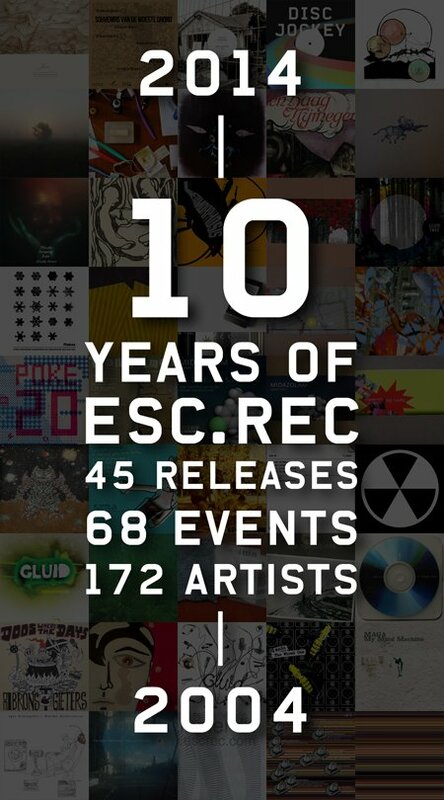 Also Esc.rec.’s releases, events, design and the label itself were praised in well over 250 reviews and other publications. I figured this calls for some sort of celebration, so I decided to grant you all a 50% discount(!) on all Esc.rec. releases. Only for today. And maybe tomorrow. Just go to Bandcamp, start ordering and use discount code ’10’. Also, if you’re anywhere near Deventer (NL) on Sunday 14 December, please come raise your glass at the next Esc.rec. event: Coolhaven in Theater Bouwkunde.